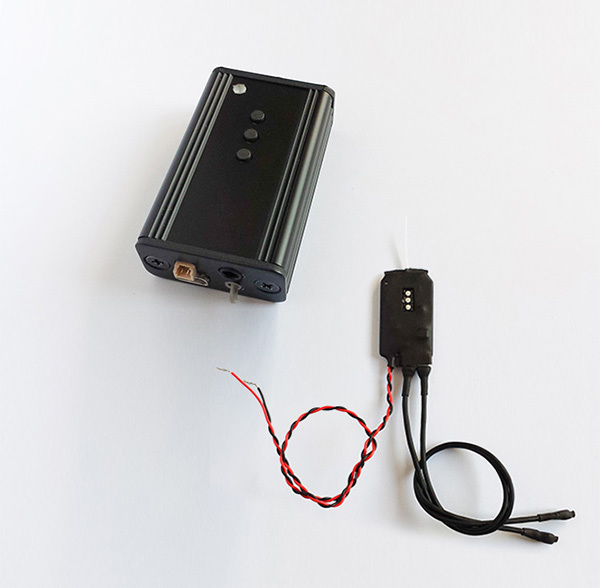 The GHOST SYSTEM Digital Transmitter is a new tiny audio transmission system. The system is designed to transmit the voice in stereo mode with high quality and digital encoding. The high quality and the “hidden” transmission are the great revolution in the intelligence world. The GHOST transmits from within the WiFi bandwidth making it very difficult to spot by counter measures teams. The system is composed of the transmitter GHOST-T and the receiver GHOST-R.
with external micro power supply 110-220Vac. The Ghost System Digital Transmitter was designed and developed in order to finally transmit by radio the audio picked up by two microphones with a very high quality. The wireless system is completely hidden and protected by a unique ID and cannot be intercepted. The small size of GHOST-T make installation quickly and safe even in many objects. The radio coverage in the open field ranges from about 100 to 400 meters. The audio level on the GHOST-T can vary from a minimum of -3dB to a maximum to +18 dB, in steps of 3 dB. The battery charging Li-po inside the GHOST-R takes about 2 hours.